Ultra Industries Inc. Pulse Jet Dust Collector. 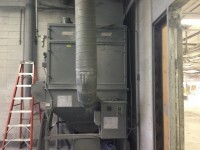 2,000 CFM ICM Dust Collector, Pulse jet type, 10 hp blower. Flex Kleen Dust Collector, 7.5 hp, stainless steel housing. Dust Collector, pulse jet, 4 cartridge dust collector. Dust Collector, Pulse Jet, stainless steel, insulated. Pulse Jet Dust Collector, 88 bags, 5" diameter x 10' long bags.